Starting with the premise that Europe was made by its imperial projects as much as colonial encounters were shaped by events and conflicts in Europe, the contributors to Tensions of Empire investigate metropolitan-colonial relationships from a new perspective. The fifteen essays demonstrate various ways in which "civilizing missions" in both metropolis and colony provided new sites for clarifying a bourgeois order. Focusing on the eighteenth, nineteenth, and early twentieth centuries, they show how new definitions of modernity and welfare were developed and how new discourses and practices of inclusion and exclusion were contested and worked out. 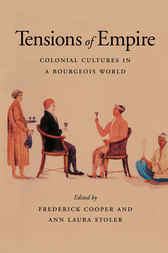 The contributors argue that colonial studies can no longer be confined to the units of analysis on which it once relied; instead of being the study of "the colonized," it must account for the shifting political terrain on which the very categories of colonized and colonizer have been shaped and patterned at different times.